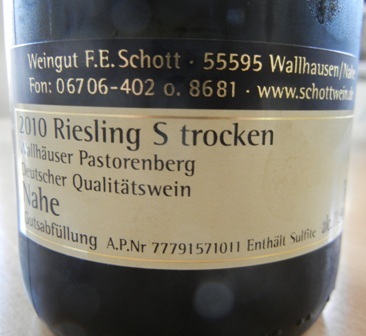 Very nice and very drinkable wines from the Nahe are wines from the F.E. Schott Family Estate in Wallhausen, Nahe. About a year ago, I have met Michael Schott, the family wine-maker, at a wine festival in a suburb of Berlin where he and his mother presented their wares to the German capital city’s consumers. I had used the opportunity to sample some of the wines. Because of my maternal grand-father and my long connection with the Nahe wine region (about 4,200 ha under vines), I just cannot ignore the wines from this jewel of a wine region. 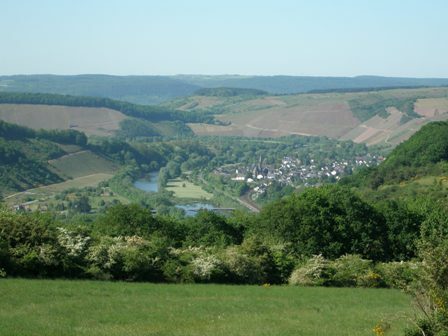 The location (terroir) Wallhaeuser Pastorenberg is one of the five vineyard locations in Wallhausen and Bad Kreuznach the family cultivate today. Since 2009 the brothers Michael and Benjamin have taken over the cultivation of the estate. benjamin is taking care of the vineyards and Michael is making the wine. 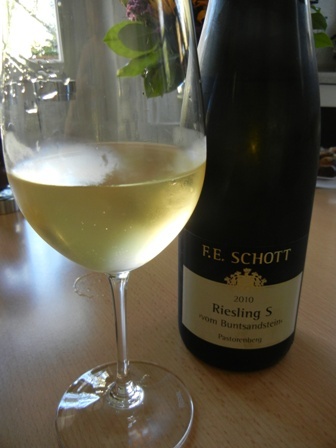 Apart from Riesling, also Pinot Gris, Pinot Blanc are grown. 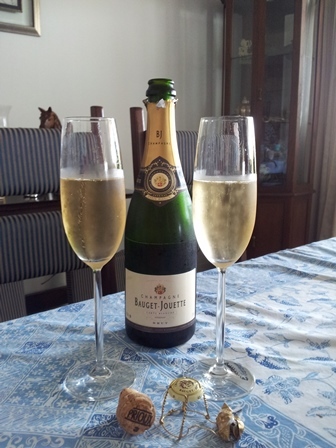 The red grape varieties include Dornfelder, Dunkelfelder, St Laurent and Pinot Meunier (Schwarzriesling). The 2010 vintage was not bad. 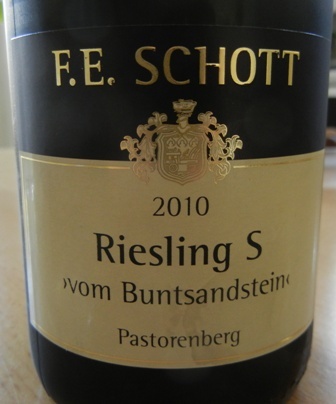 The ‘2010 Riesling S “Vom Buntsandstein” Pastorenberg’ is a dry wine which won a gold medal at the local winery associations wine awards competition. The price is very reasonable (7 Euro/bottle). It is an easy drinking wine for every day consumption. You should visit the family (they are very nice people) winery when you are near Bad Kreuznach. Wallhausen (with about 224 ha under vines) is a very pictureque little place. This entry was posted on Thursday, November 3rd, 2011 at 6:16 pm and is filed under Vineyard profile, wine, wine regions, wineries. You can follow any responses to this entry through the RSS 2.0 feed. You can leave a response, or trackback from your own site.